Quality signs that help your business grow. One of America's largest sign providers. We have seen first hand how a sign can positively affect the profitability and financial health of a business like yours. 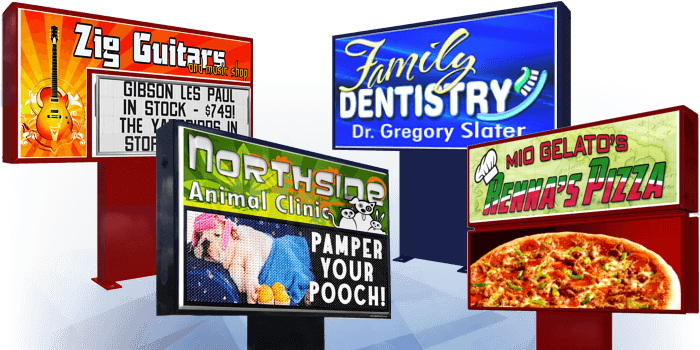 We are committed to providing you with a quality business sign that will generate a positive return on your investment. Our digital displays offer your business state-of-the-art sign technology combined with the highest level of quality and service. Project a dynamic presence into the community! Our changeable letter business signs allow you to effectively communicate with all who pass by. Easily and safely change letters with our Glide & Lock© support system. When graphic appeal and boosting awareness are your focus, these signs are the solution. Identify your business, enhance your grounds and become a source of civic pride. Bring large-scale video capabilities to your events with a state-of-the-art LED video wall. Turn any wall into a dynamic centerpiece and take your business to the next level! It is a beautiful sign!!! I was at a dealer meeting last week when a competitive dealer told me how much he loved our sign. I would reccommend your company to anyone. Thank you again. I'm very pleased with the appearance and quality of my sign; it exceeded my expectations. Attractive business signs that get you noticed.